Presidential election polls for 2020 are rolling in, and we’re collecting them all in one place for you! You can check out the latest on our polls page, which we’ll update every day with polls of the Democratic and Republican presidential primaries, as well as head-to-head matchups for the general election. You can download the data at the bottom of the page or at data.fivethirtyeight.com. And if you see any polls that we missed, please shoot us an email at polls@fivethirtyeight.com. While we have you here, though, we thought we’d explain a little bit about the choices we made for displaying 2020 primary polls. Showing polls for a race that is still (relatively) far in the future creates some challenges. In particular, we had to come up with a design that works for polls that ask respondents about a lot of candidates — sometimes 25 or more. And those results have to be displayed along with the results of surveys, such as presidential job approval or generic congressional ballot polls, that have only two main answers. So in the updated version of our polls page, the default view will show only the most popular choice in polls in which respondents were asked about multiple candidates. To see the rest of the candidates in the poll, click “more” to expand the list of results. It’s not a perfect solution. This early in the primary season, any of the Democratic candidates could realistically become the front-runner, and we’d prefer not to display one and hide others. But this strategy allows us to keep all the polls in one central location where they are easily discovered. 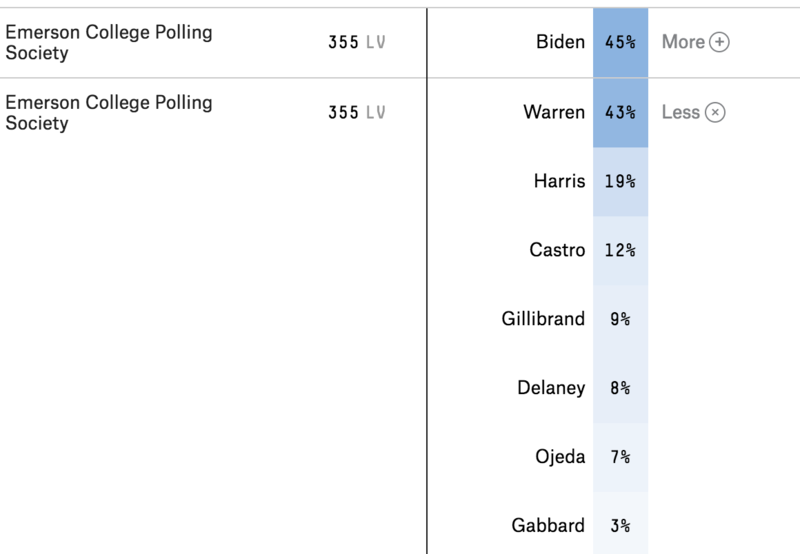 As the volume of polling picks up ahead of the 2020 election, we’ll expand how we track the latest survey releases, but this page will fuel all FiveThirtyEight’s 2020 work to come.